This slow cooker Indian chicken curry recipe, aka crockpot chicken curry, is a simple, easy and effortless recipe with only ten minutes of hands-on work and a few hours of slow cooking. This beautiful deep red curry is flavored with exotic Indian spices and can be served over a bowl of rice or with a simple crusty bread. A good chicken curry is like an amazing treat!! My kids favorite. It’s the color, the flavor, the aroma, it’s …. well everything. I have a few friends who love Indian food and have been asking me to make a slow cooker version. 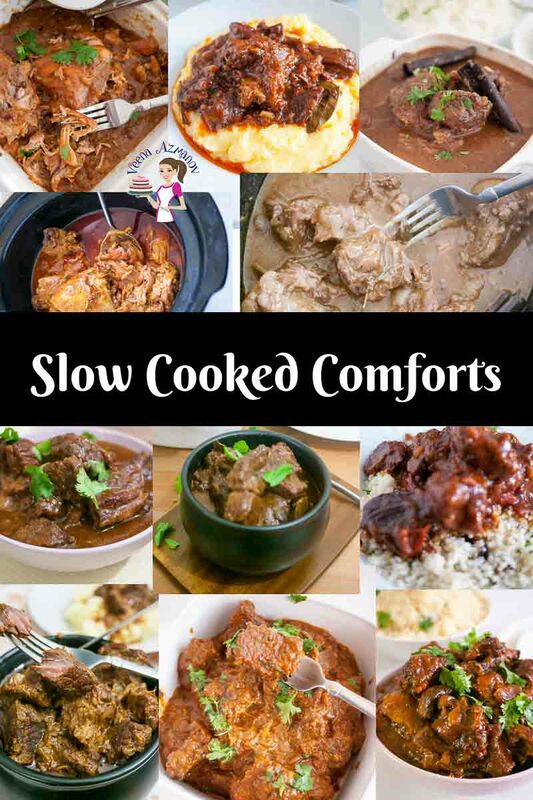 So this post is especially for those who love the slow cooker. The secret to Indian cooking is not just in the spices but how you bring life into those spices. The right blend and the right cooking technique can make a huge difference from curry to curry. Many people associate the slow cooker with throwing ingredients into the pot and let it cook itself out. Nah!! With me, it’s always about taking it a step further. So, that’s what I’m going to show you with this slow cooker Indian chicken curry. Can you see that color? That comes from using this method. I think you will love it. After all, we eat with our eyes first – don’t we? It’s probably that color that got you to this post. And it will the be the aroma that will have you making this over and over again – I promise. 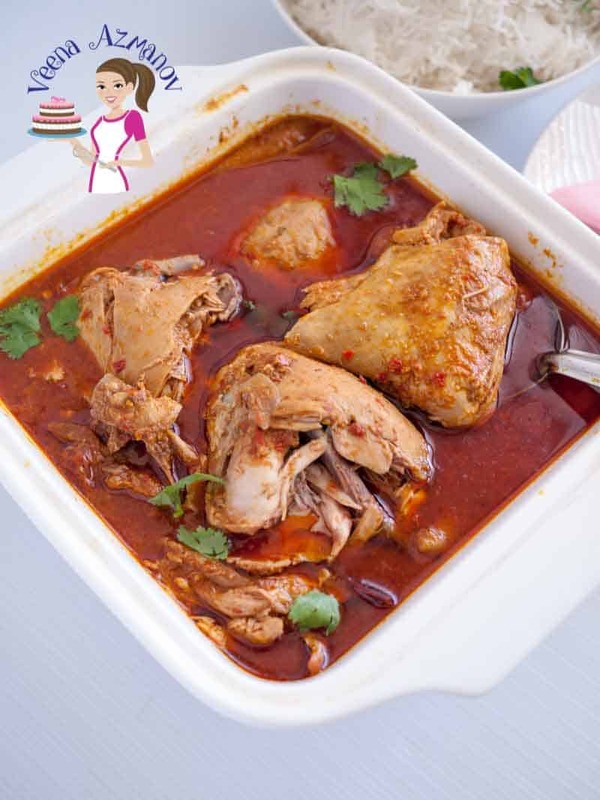 Chicken Thighs/Legs – when cooking in a slow cooker it’s best to use cuts that will endure the long cooking. Personally, I do not like using breast for curries or slow cooking. And yet, you can use chicken breast and reduce the cooking time to 2 hours on high. Spice mix – coriander, cumin, garam masala have become common spices to have in every kitchen. These can be used in Asian, middle eastern and sometimes even Mediterranean cooking. Curry powder is usually a blend of common Indian spices and can be used as a substitute. So if you have curry powder and prefer to use that instead of buying any of these then…. add 2 tbsp of curry powder and 1 tsp of smoked sweet paprika instead of the spices mix. 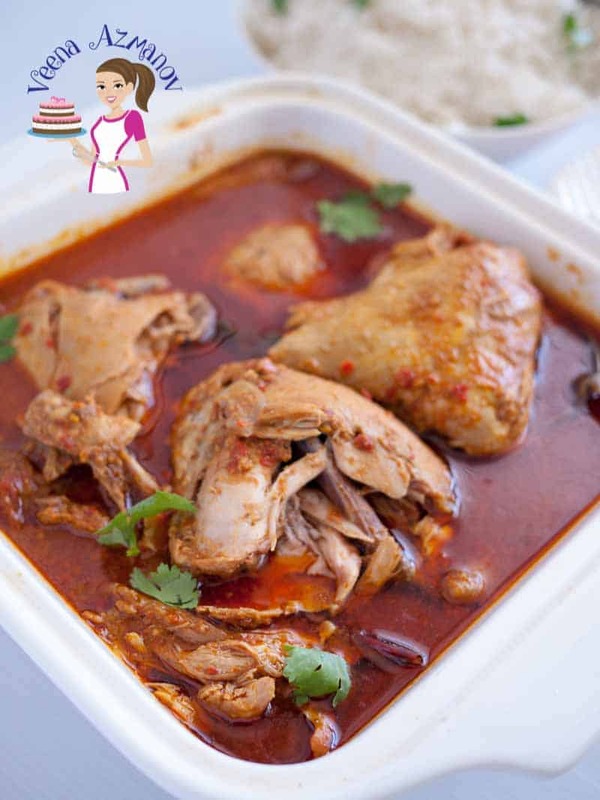 Yogurt – I love adding yogurt to my chicken curry but if you need a non-dairy or parve’ chicken curry -please substitute the yogurt with the same amount coconut milk. Cherry tomatoes – You can use regular chopped tomatoes of course – I love the sweetness and color that cherry tomatoes add to the curry. Often cooking in a slow cooker means the chicken will fall off the bones. To make it more easy for the kids and us to eat. I usually pick each piece out, use two forks to take the bone which usually just falls off very easily. That way the kids get only chicken and gravy, no bones. The bones do add so much more in terms of flavor; just not fun when you get them in the fork. I know! Don’t have a slow cooker? Not a problem!! I am showing you this recipe with the slow cooker. And yet, it is not absolutely necessary that you cook it in a slow cooker. I’ve been using my slow cooker for less than a year now. Before then I made this on the stove top. And it’s much quicker too! Below I have given you the alternate method which is stovetop cooking. If you cook it on the stovetop on medium heat you will need only 45 minutes until the chicken is cooked thru. 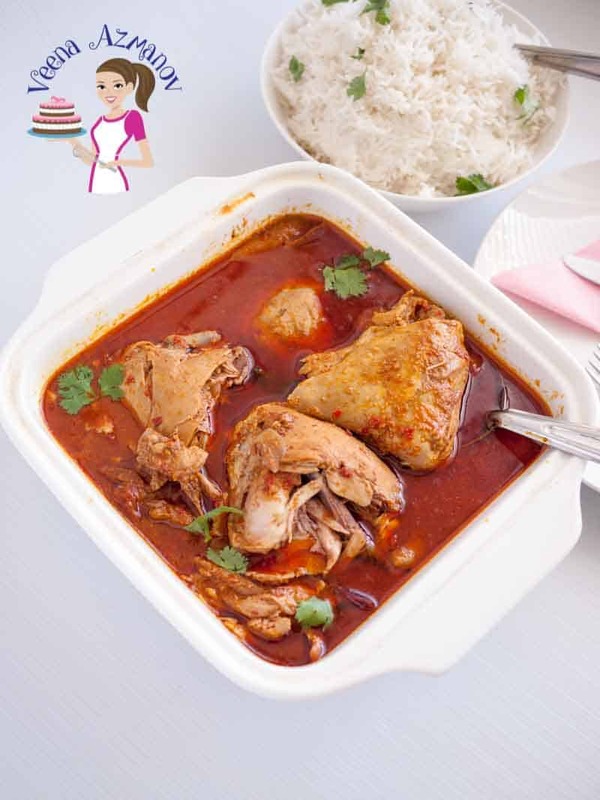 Nothing beats a good chicken curry over a bowl of steaming hot rice. And yet, I also love dipping my crusty bread in a good bowl of curry! YUP! You can keep the chicken just given me my curry and crusty bread and I’m in heaven. Clean, wash and drain chicken. In a food processor grind onions, ginger, garlic to a smooth paste. Add 1/4 cup water and spice mix powders and blend some more. Add the spice marinade and cook on medium to low for about 3 to 5 minutes until fragrant. Place seasoned chicken in the bottom of a slow cooker. Pour the sauteed marinade over it. Add yogurt and the can of cherry tomatoes. On low for 5 hours. Or on high for 3 hours. Lastly, add chopped cilantro and lemon juice – Stir. Alternatively, cook chicken on medium heat for 45 minutes until the chicken is cooked thru. Lastly, add chopped cilantro and lemon juice. Heat two table oil in a frying pan. Pour the sauteed marinade over. Lastly, add chopped cilantro and lemon juice - Stir. Love Slow Cooking? Me too! You can find more of my slow-cooked recipes here whether you have a slow cooker or not. Alternatively, you can see my Recipe Index for all available recipes on this blog. Thank you, Dankia!! So happy to hear you had success with this recipe and your family loved it so much. Thank you for coming back to write this feedback, appreciate it very much. Always a great feeling to read such success and positive comments. Thank you. Made this last week and it was one of the best Indian curries I ever ate. So easy to make. I never know making Indian food at home was possible for me but I did it. Thank you . Thank you Neville. So happy to hear that you had success with this recipe and loved it so much. Thank you so much for coming back to write this feedback. Appreciate it so much. Thank you for this recipe. I love how easy it is to make. Everybody loved it so much. I’m definitely making this again. Thank you Chuck. So happy to hear everybody loved it. Sounds amazing! Thanks for the recipe. I am going to try to introduce the less spicy curries to my kid. She is finally getting into handling a little spice. I loved curry when I was pregnant so I have high hopes! Thank you Amanda. My kids so eat these curries. They aren’t very spicy. Yes you need to start with much less so their taste buds learn to appreciate it slowly. 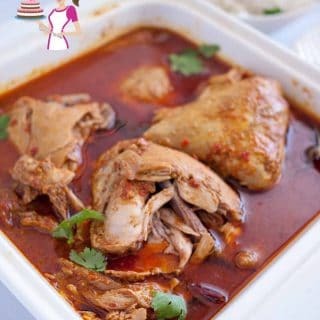 This is not only delicious but also you made it easy by putting everything in the slow cooker, your spice mix sounds perfect love the color .My kids love chicken curry. only need a bowl or rice or few chapathi. We are curry lovers. If you can make it in the slow cooker, even better. This would be perfect to make a huge batch and put some away in the freezer for when things get hectic again in the fall. Love the flavour profile. Will tuck this away for a rainy day…and believe me we have had our share these days. Thank you Gloria.. I hear ya. As a working mom I have one too many hectic days. I think this will do great for those days. I’ve never made curry in a slow cooker and am always looking for new slow cooker recipes! This is great! This week has been a busy week with summer events and schedules happening. I used the crock pot make a roast a few days ago and just loved that it lasted awhile. 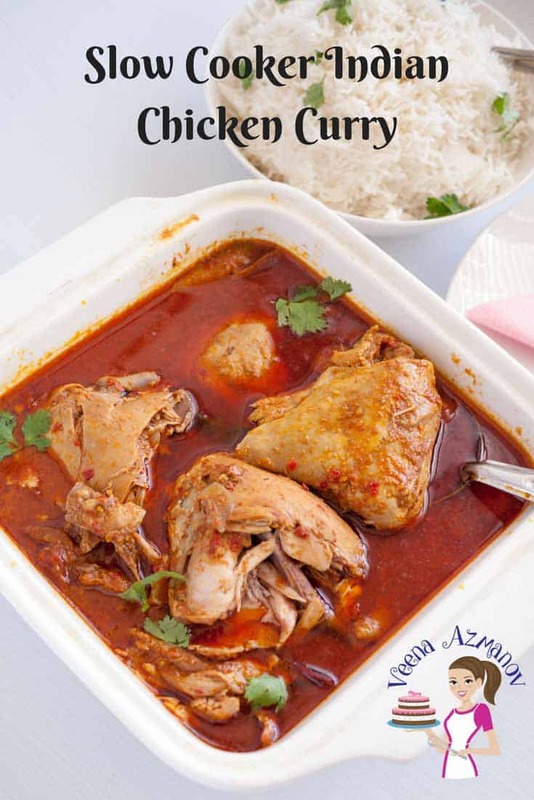 I can’t wait to use the slow cooker for this chicken curry recipe this week now, yum! So true Jessica. It’s really easy to use the slow cooker of busy days. 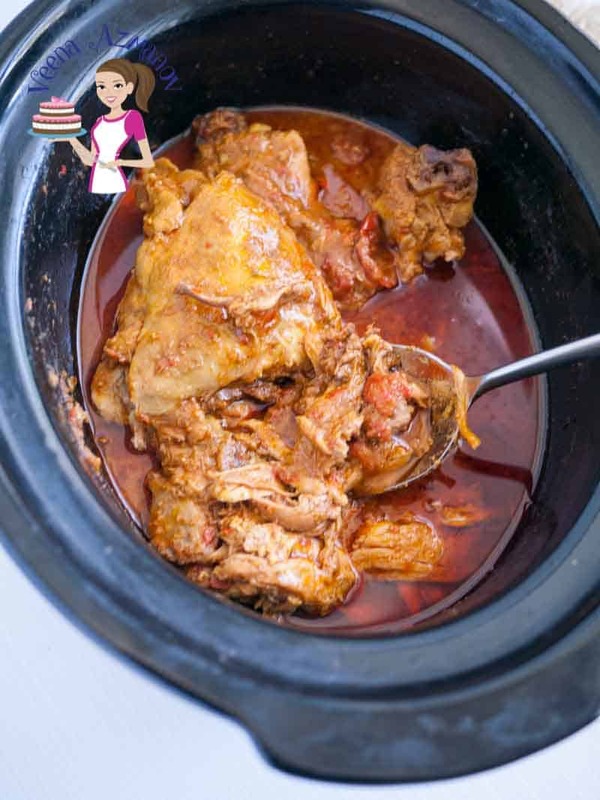 I love making this one in the slow cooker.Works wonderfully and the aroma in the last two hours just makes you more hungry. I’m so glad you posted this curry recipe. I love purchasing spices and then I look for recipes where I can use them. I have several jars of curry — and I’ve been wanting a good recipe. The chicken curry looks so delicious. We are always wanting to do something different with out chicken — this is it!!! Awesome Marisa. Now you can use them in a few of the Indian recipes I have here on the blog. 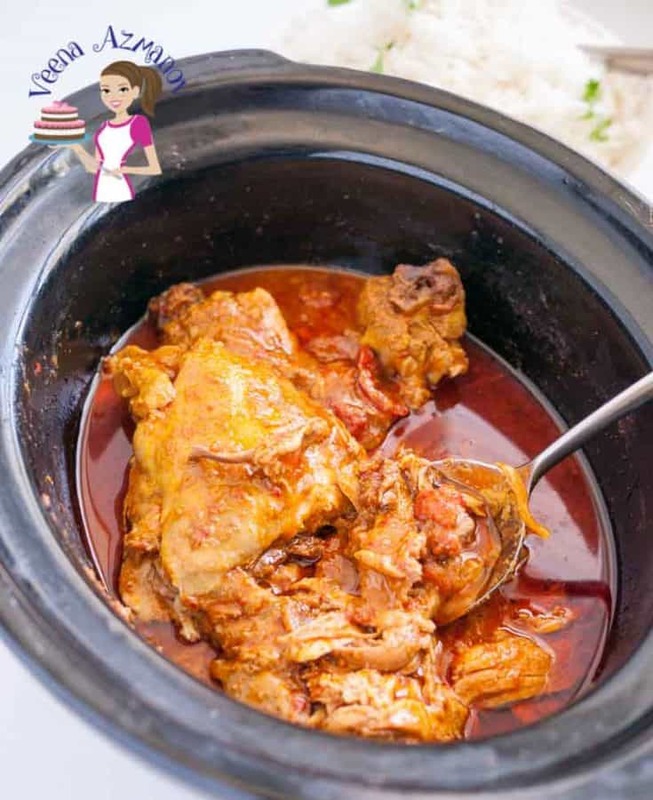 Veena, the colors are GORGEOUS in your slow cooker Indian chicken curry!! I would totally gorge on these with some hot rotis. Thanks for sharing the tips on cooking the meat in slow cooker as I’m very new to slow cooker cooking and I love using cherry tomatoes in curries for the same reason 🙂 A true #comfortfood recipe ! Thank you Molly – Isn’t it! I love a good color on my chicken curry. And I’m so enjoying making chicken curry in the slow cooker. I love cherry tomatoes in my curries.. I think it’s so pretty too! I love curry, it’s such a bright and flavorful dish. Being able to make this recipe in the slow cooker and not heat up the house is great. I’m all about slow cooking in the summer! Curries do so well with such a long cook time, too. Imagining the smells and deliciousness coming from your kitchen! Same here Kylee. I love using the slow cooker in summer so I don’t have to spend time in the kitchen.